alaTest has collected and analyzed 5053 reviews of GoPro Hero3+ Black Edition. The average rating for this product is 4.4/5, compared to an average rating of 4.0/5 for other Camcorders for all reviews. Reviews about the battery and portability are on the whole positive. The image quality and price are also mentioned favorably. There are some less positive opinions about the zoom and viewfinder. There are some mixed reviews about the reliability. We analyzed user and expert ratings, product age and more factors. 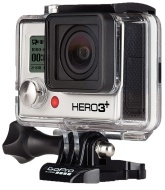 Compared to other Camcorders the GoPro Hero3+ Black Edition is awarded an overall alaScore™ of 93/100 = Excellent quality. alaTest has collected and analyzed 98 user reviews of GoPro Hero3+ Black Edition from Amazon.co.uk. The average user rating for this product is 4.4/5, compared to an average user rating of 4.0/5 for other Camcorders on Amazon.co.uk. Reviewers are impressed by the portability and durability. The image quality and battery are also appreciated, whereas opinions about the size and price are mixed. alaTest has collected and analyzed 1939 user reviews of GoPro Hero3+ Black Edition from Amazon.com. The average user rating for this product is 4.2/5, compared to an average user rating of 3.9/5 for other Camcorders on Amazon.com. Reviewers really like the battery and portability. The image quality and price are also mentioned favorably. Many are critical about the viewfinder and zoom. The king of the action cams returns - but will it still rock our world? GoPro will debut new software and flexible mounts for the Hero3+ optimised for professional filmmakers, cinematographers and post production studios at NAB 2014 in Las Vegas next week. Although it's more revision than revolution, the Hero3+ maintains GoPro's position at the top of the action cam market. The GoPro Hero3+ Black Edition produces some of the best -- if not the best -- video we've seen from an action cam. Its abundant resolution and frame rate options will satisfy beginners and experienced shooters. Navigating the on-camera settings menus still isn't the best experience. Battery life can be brief depending on the features you're using. Plan to buy accessories including a microSD card. GoPro's Hero3+ Black Edition shoots the best 1080p footage we've seen on an action camera. Windows operating systems supported:Multi function bay docking station connector / UL, CUL, FCC-B, CB, CE, TCO'5.0, ICES-003B, GOST-R, HYGIENIC, ENERGY STAR, CCC, CEL, BSMI, PSB, C-Tick, WEEE, RoHS.